Raygan Batton: Hero 11APR16 | Heroes and Angels Corp.
Todays hero is Raygan Batton. It brings me great pleasure to honor Raygan as our hero of the day. Some of you may remember Raygan from the ride last year. Its great to hear that Raygan is doing well. Here is the latest on Raygan followed by the post from last year when we honored her. Here is the link and the story from last year…. ss that did not belong there. Long before Ray Ray was done with treatment, the community and an army of volunteers, stepped in to show their support of Ray Ray. The community came together and helped raise funds to support Ray Ray and her grandparents. There were several different events to include: a vendor fair, an expo, cake walks, lemonade stands, area athletic teams hosting benefits, Ray of Sunshine Festival Day, and others. What I am amazed at is how this community pulled together to help this young lady out. It’s amazing to see the effort put in by all those folks to help one person. Ray Ray and her family have also been able to pay it forward. They were able to donate to several families that were dealing with childhood cancer, as well as to the UVA Children’s Hospital through the “Racin with Raygan” event and several other events. As of April, Ray Ray has been free of any evidence of the disease. 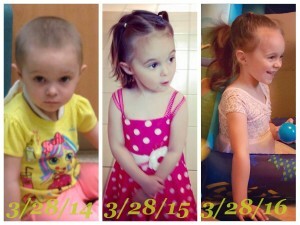 She has beaten a disease that has taken the life of so many. That doesn’t mean she will live the rest of her life cancer free, but for now she is winning the war. 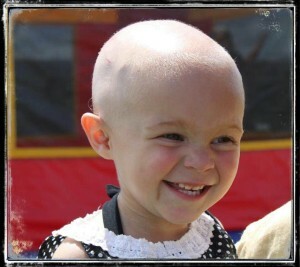 Raygan is a blessed three-year-old little ray of sunshine who lives with her grandparents, Gene and Donna Abshire. And it was Donna who discovered the lump in her stomach one day while bathing Ray Ray. Ray Ray referred to the lump as a monster in her stomach and never thought anything was wrong with her stomach. She was and is, always a pleasant child to be around. You can usually find her smiling, laughing, and singing with her grandmother Donna. Raygan Batton is a strong young lady. She has been blessed to have such caring and loving people around her. She is a childhood cancer survivor and today Raygan is my hero. Ms. Ray Ray, today I honor you, my hero, by riding in your name. You are a survivor, and a true testament of what good, can come from people in general. I am honored to ride this day, 10MAY15 in your name. May your day be blessed, and if our paths should cross again, I would love to meet you in person. Godspeed Ken. RayRay is such a sweet little girl, and she will win in the end.